was issued as a mass-market paperback by Berkley Publishing under its Boulevard imprint. normally found: drugstores, supermarkets, poolhalls, racetracks and assorted cultural centers. information not contained in any previous edition. It is expected to be the first in an ongoing series from Berkley. Please Do Not Order This Book from Creatures at Large Press. 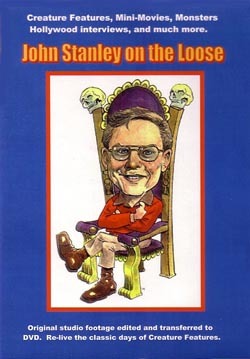 This fourth-edition, 460-page trade paperback edition in the series -- replete with an introduction by one-time CREATURE FEATURES host John Stanley, 5,614 reviews, 232 photographs, 24 drawings, home video/laser disc information, and 1709 cross titlings -- is retailing in stores for $20. DISCOUNT RATE of $10 plus $2.00 POSTAGE. Saving $10 is nothing to squeeze at in today's overinflated, gotta-have-a-retail-price world. 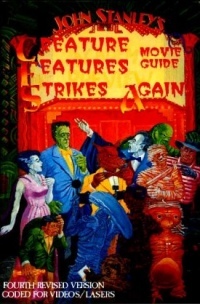 This wide-ranging volume contains hundreds of reviews that the newer edition--Berkley's CREATURE FEATURES: THE SCIENCE FICTION, FANTASY AND HORROR MOVIE GUIDE--does not have. Hence, completists should seriously consider this book for their collections. 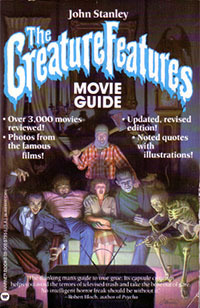 It is unlikely that these deleted reviews will be reprinted in the near future, even though they will remain in the CREATURE FEATURES MOVIE GUIDE database. This handsome version of THE CREATURE FEATURES MOVIE GUIDE STRIKES AGAIN comes with slipcase and dustjacket, and has the title engraved on the box. Each copy is hand numbered and will be signed by the author to your personal specifications. It is normally a $50 retail item in stores. However, You Can Order at the Startling, Stunning DISCOUNT RATE of $25 plus $2.50 POSTAGE. When John hosted "Creature Features" in the San Francisco Bay Area, from 1979 to 1984, he interviewed hundreds of major figures in the sci-fi and horror fields, produced dozens of mini-movies, and hosted well over 200 shows. Most of these gems were lost when the TV station thoughtlessly recorded over the original tapes. Miraculously, John was able to save some of his favorite segments with the cooperation of sympathetic station engineers. 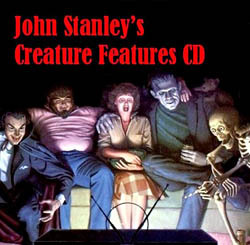 This DVD is a rare look at the fun days of "Creature Features" John Stanley style. sci-fi trailers of the 50's, trailers from John's favorite movies, and lots of extras. Ray Bradbury "Something Wicked This Way Comes". insider information on the original "Psycho" and Alfred Hitchcock. A rare group of photos taken on the Channel 2 set plus many extras. show. New York stake skit. Bad Seed skit. The IRS Lady meets the Werewolf. John visits the Hee-Haw set. "Little Shop of Murders" & "Attack of the Killer Scarecrow ( 2-parter). "Revenge of the Channel 2 Dragon"
on the making of the show. Lots of Creature Features show clips and previews. 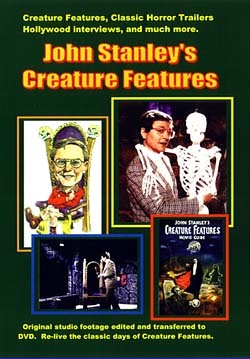 A fantastic history of Creature Features, John Stanley style. Each DVD is $15.00 each plus $2.00 for shipping (per order). DVD-R format. The sounds of Creature Features on CD! Perfect for that lonely Saturday night with nothing better to listen to. For the low price of $7.00 each plus $2.00 for shipping.